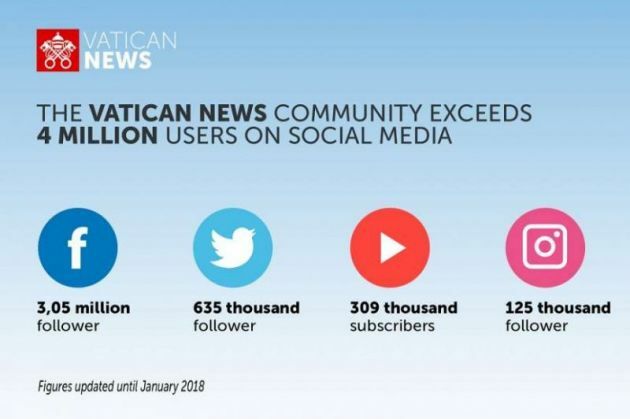 The Holy See recently rebranded its media outlets under the Vatican News logo and it has announced it has a community that exceeds 4 million users on Facebook, Twitter, YouTube and Instagram. 500 years after the Reformation began Christianity has come closer, but is still divided. The Vatican's Secretariat for Communication said on Jan. 9 the is due to an ongoing reform of Vatican communications launched in 2014 by Pope Francis and his nine cardinal advisors. They make up the Council of Cardinals, which meets every few months to discuss the ongoing reform of the Roman Curia according to Catholic News Agency. The launch of a Global Page on Facebook, brought together more than three million followers, who can now consult the pages of the six languages currently available (English, Italian, French, German, Spanish and Portuguese). To map out what a possible reform of Vatican communications, the Pope in 2014 established an international commission headed by British Lord Chris Patten to study the current process and provide suggestions. Francis then established the Secretariat for Communications in June 2015, naming Italian Monsignor Dario Vigano as its first head, with its focus on consolidation and increasing the news service's presence in the digital world. The secretariat oversees all of the Vatican's communications offices, including Vatican Radio, L'Osservatore Romano, the Vatican Television Center, the Holy See Press Office, the Pontifical Council for Social Communications, Vatican Internet Service, the Vatican Typography office, the Vatican's Photography Service, and the Vatican publishing house. At the Council of Cardinals' most recent meeting in December, Vigano unveiled the new logo and design for the Vatican News website. This consolidated the Vatican's former news and radio pages into a new multimedia hub, which features audio, text, video and graphics, available in multiple languages. The Vatican's YouTube channel, which offers viewers live coverage of the Pope's activities, has also been rebranded with the same new logo and given the "Vatican News" title. Pope Francis has a high number of followers on his various social media accounts, which include his "@Pontifex" account on Twitter.